The vermillion red sun slid down behind the hills as I wiped the grime off my face, my hair in deep tangles, a happy grin spreading from ear to ear. “You look like the Cheshire Cat,” the husband observed. I was visiting the world heritage site of Hampi and the adjoining Daroji Bear Sanctuary, some 15 kms from Hampi, and I had reason enough to behave like the cat from Alice’s wonderland. The stark landscape of Hampi, with its exquisite ruins and artfully scattered boulders, precariously balancing at implausible angles, had left me breathless with awe. It held me absolutely spellbound and I realized that I would not find solace till I made another visit to this beautiful land. I had visited Hampi the first time in early October 2015, the monsoons having receded somewhat and the sun beginning to show its might. The trip was to be a short one, primarily for the purpose of providing solace to my harried self by gazing soulfully at the ruins of Hampi. For the first time, birding was expected to take a second seat. But the brief, fleeting glances that I had of the wildlife and the winged beings there were momentous enough to entice me and before long, I found myself gallivanting happily amidst the beautiful boulder-strewn landscape again. The second visit was on New Year’s Eve (30th December 2015 – 2nd January 2016). Here, I must clarify a few things. 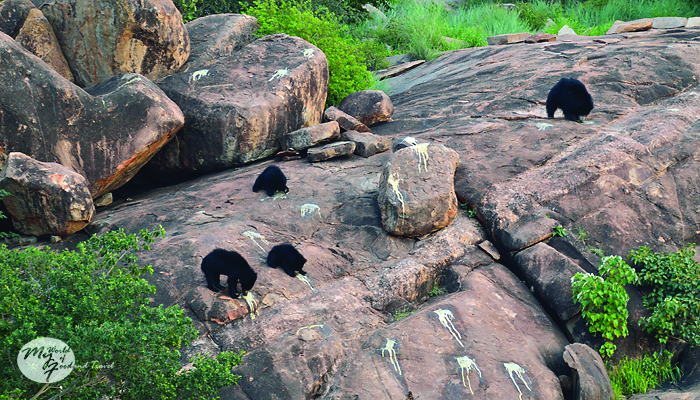 When I say Hampi, I also include in the same breath the neighbouring Daroji Bear Sanctuary. The fact that I visited the region twice, once with rains and once without, plays games with my mind and so pardon me if I say lush green vistas one moment and parched yellow the next. On my return from the first trip, I had decided to delve a bit into the avian and wildlife scenario of Hampi. One name recurred frequently as I turned digital page after page on the subject. That of the naturalist/conservationist/photographer/birding guide all-in-one wonder of Pompayya Malemath. For the first time since we turned birding enthusiasts, we decided to take the help of a local expert. 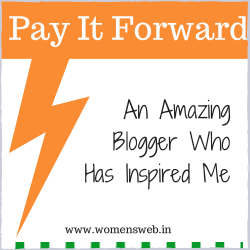 We contacted him and opted to stay in his homestay, although he had offered us another option of staying in the Kamalapur forest guest house. 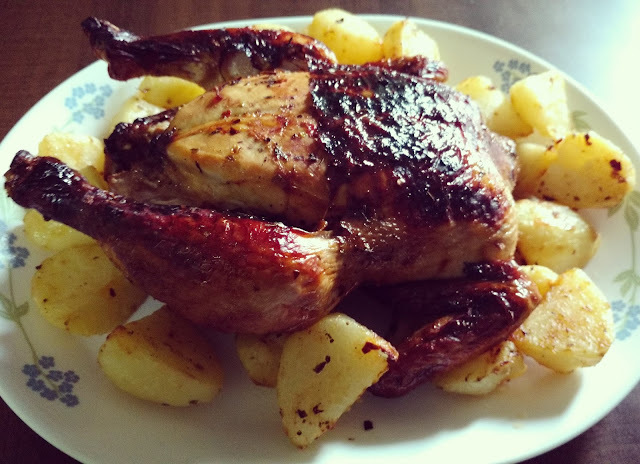 We were bowled over by his hospitality at his homestay, particularly the delicious food his wife had cooked, and asked him to suggest out an itinerary for us. 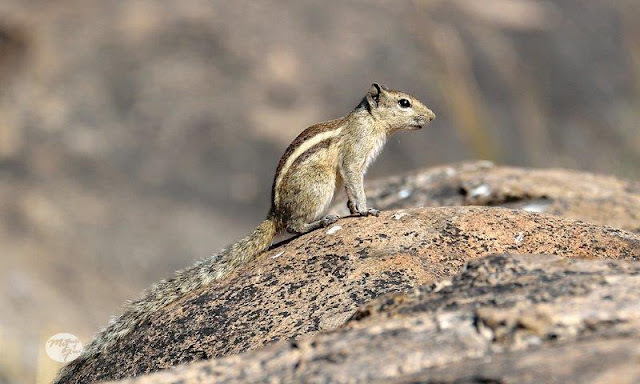 The best part of visiting Hampi is that you get to mix business with pleasure – that of visiting the magnificent ruins along with birding – the best of both the worlds. So, in the three days that we stayed there, birding would be carried on in the early mornings and late afternoons, while sightseeing would be during the interim period. 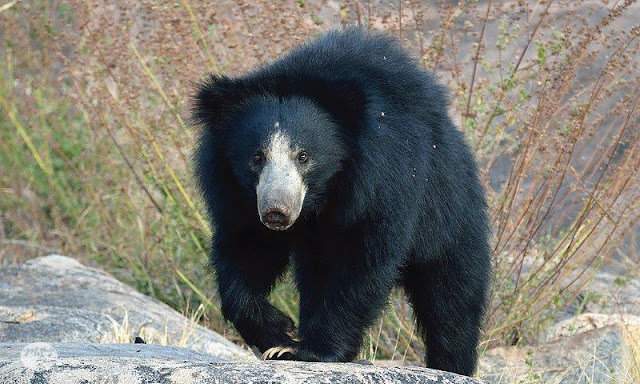 One of the major highlights of both the trips was the sighting of the Indian Sloth Bear at Daroji Bear Sanctuary. 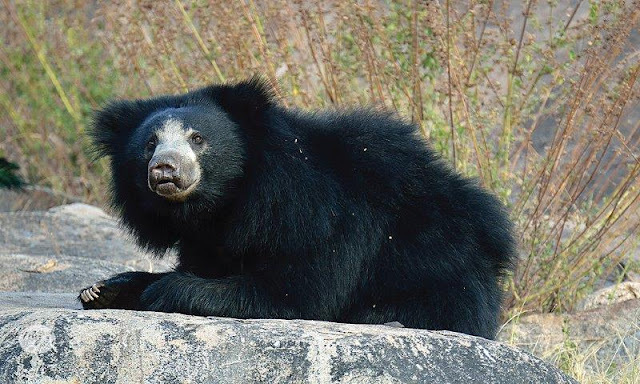 The sanctuary is spread over 82.72 sq km and was created exclusively for the preservation of Indian Sloth Bear. It is open between 4 PM to 6 PM on all days. 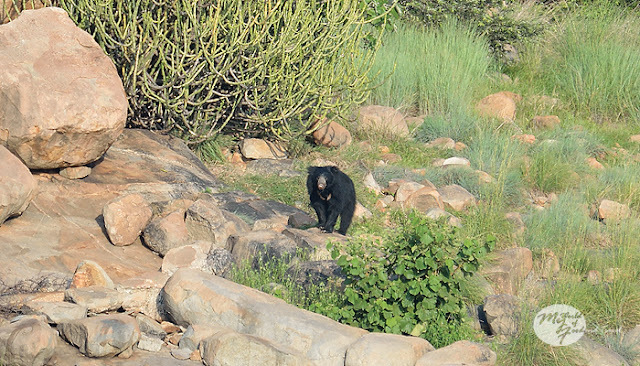 There is a watch tower within the sanctuary that provides a vantage point to view the bears emerging from the adjacent hillocks during late afternoon hours to taste the jaggery paste smeared on the boulders. This novel concept by the forest department of slathering the rock faces of the hillocks facing the watch tower with a concoction that tasted of the bear’s favourite food jaggery and honey, made it a dramatic sight for the visitors. 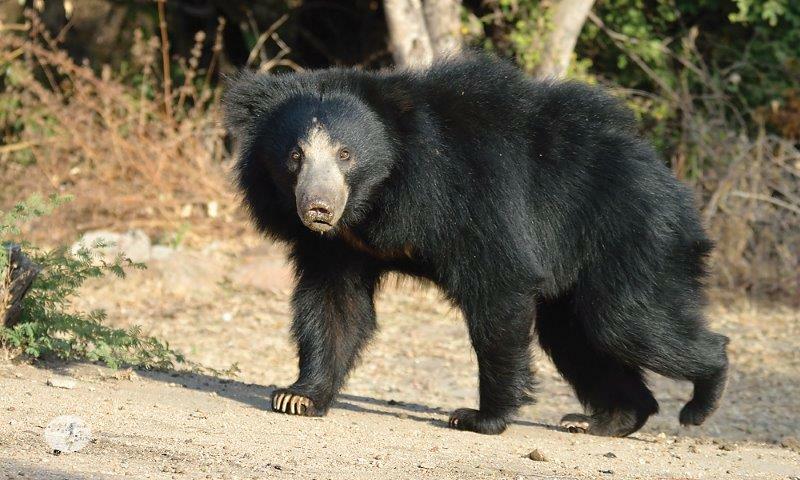 It also ensured that no one went back disappointed without sighting the famed bears which, as mythology would have it, bore their ancestral lineage to the Ramayana era. Notice the light brown patches on the rocks? That's the jaggery paste. 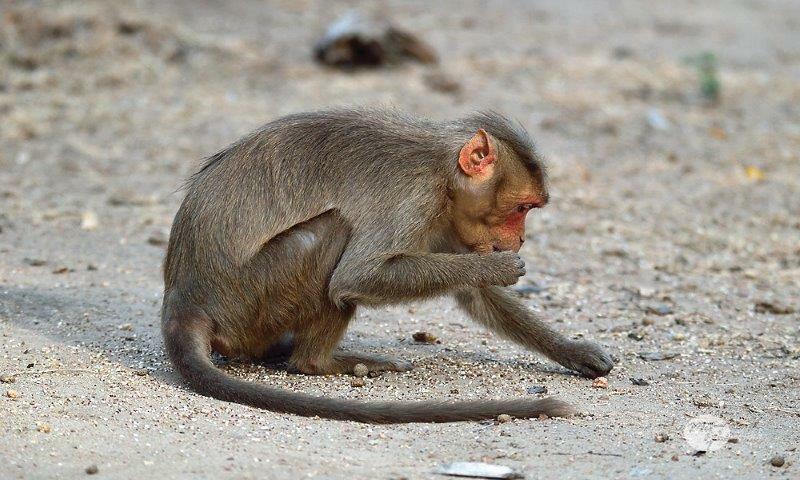 Folklore has it that Kishkinda (purportedly modern day Anegundi), the monkey kingdom ruled by Sugriva, was located on the bank of the Tungabhadra river. In the war against Ravana, Kishkinda was Lord Rama’s ally and when he travelled to Sri Lanka he was accompanied by an army of monkeys along with Jambavantha, the brave bear king. The bears of Hampi are supposed to have descended from him. Mythology aside, one of the factors behind this region supporting bears is its habitability. The large boulders hide within themselves numerous caves which are well ventilated, owing to the channels between the rocks, and provide succor to bears in bringing up their young ones. While man and bear conflicts are inevitable, given the proximity and density of human settlements, yet no extreme incident has been reported. I listened to the various stories and theories around these bears as I waited on the watch tower, waiting for them to make their appearance. 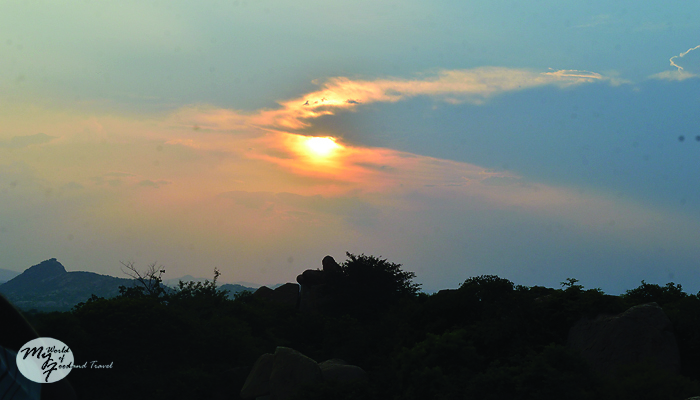 Venkatesh, the Jungle Lodges naturalist who had accompanied us, saw the look of consternation on our faces as the sun crept lower towards the west. As we sat facing the hillocks in hushed anticipation, the silence broken by the intermittent cries of the peacock, other animals and birds came out of the rocky crevices to feed upon the sweet concoction. 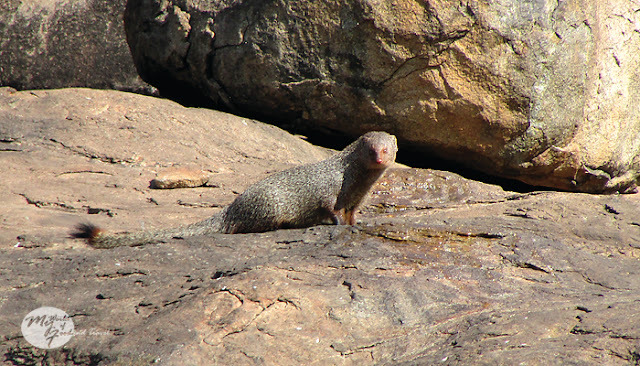 Stealthy ruddy mongoose, impish monkeys, squirrels and wild boars began feasting upon the offerings while families of bush quails, jungle babblers, painted spurfowls and grey francolins jostled amongst themselves to peck on their share. 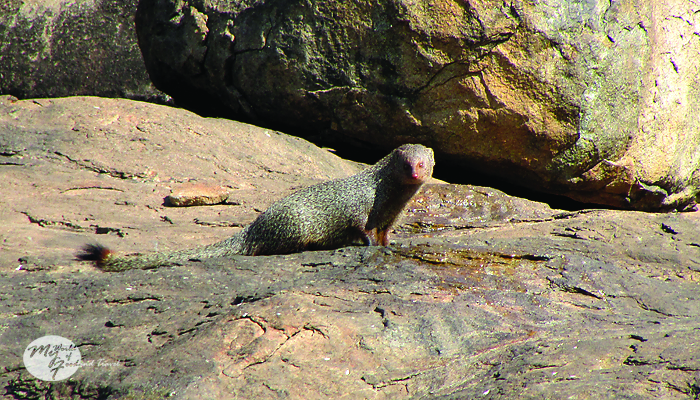 So engrossed were we in observing the antics of these opportunistic creatures that we almost did not notice the small speck of black fur ambling along towards the jaggery-smeared rock faces. The lone bear was soon followed by a mother and her two 11 months old cubs. The mothers usually carry their cubs piggyback, sometimes till they are as old as 9 months old, and as Pompayya Sir told us, it is a sight to behold. It is exceedingly endearing to see the cubs arrive at the site riding on their mother’s back and leave in a similar manner. February-March is generally the period that one can witness this phenomenon in Daroji. The mother bear we saw was quite protective around her cubs and ruled them firmly with a loud “Uhh uhh!”each time one of them strayed a bit far. 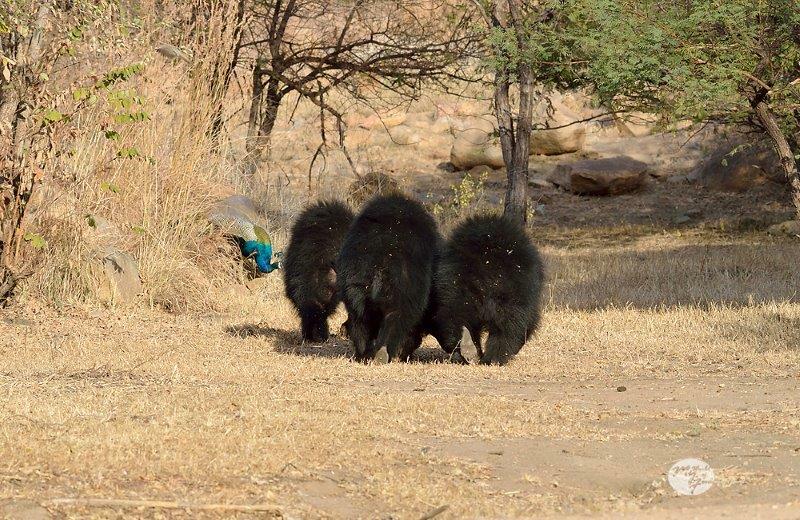 Finally, by the time we wound up our visit at 6 pm, there was a congregation of 12 sloth bears spread across different parts of the hillock range. 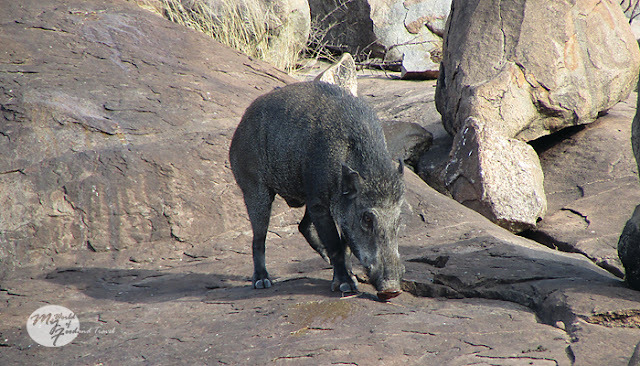 Unlike other animals, they do not gather in feeding groups. Also, I observed that they were extremely alert to the slightest of noises. A child’s squeal in the watch tower was picked up by a bear and he immediately retreated amongst the boulders. I wondered out aloud if there were any predators around that made the bears remain on their guard. I knew that tigers were not found in the region, the last of them wiped out decades ago. Apparently, there was a sighting of a leopard at dusk a few days back and it had let out a loud growl to make its presence felt. However, there was no leopard to be seen or heard on the day we were visiting and we left the bears peacefully gnawing away at their jaggery. Watching the bears was another amazing experience when we came back in winter – It was much more fruitful and we had Pompayya Sir’s guidance to thank for it. Currently, Daroji has a healthy population of sloth bears (I am unable to recollect the exact number). 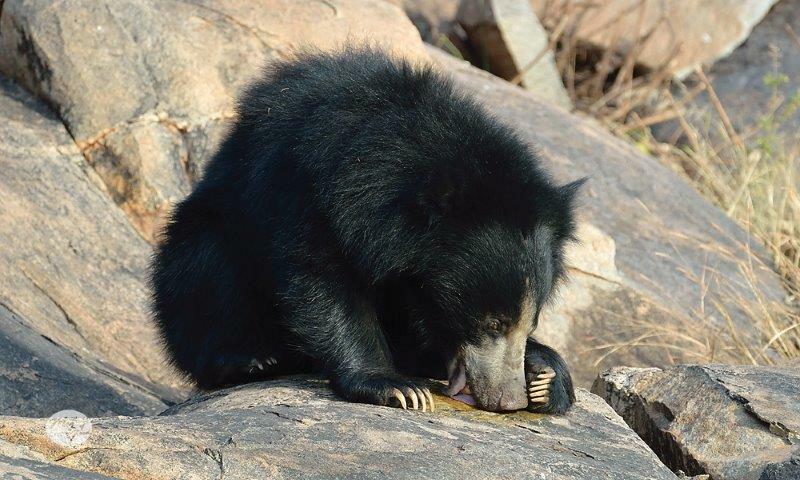 Unfortunately, the bears continue to be threatened due to illegal mining in fragmented areas of the adjoining forests. But perhaps with the forest department and conservationists’ efforts, we can hope for a safe future of these genial fur-ball giants. Their race, which attained a pride of place in the ancient scripts, deserves to survive in this era as well. PS: Since we were guests with Jungle Lodges on the first visit and with Pompayya Malemath the second time around, I am not aware of the formalities to be performed at the entry gate of the sanctuary. PPS: Hopefully, I shall come up with my birding account in Hampi in my next post, shortly, and with lot more details on Hampi. *fingers crossed* I am saving up all our bird pictures for the post! 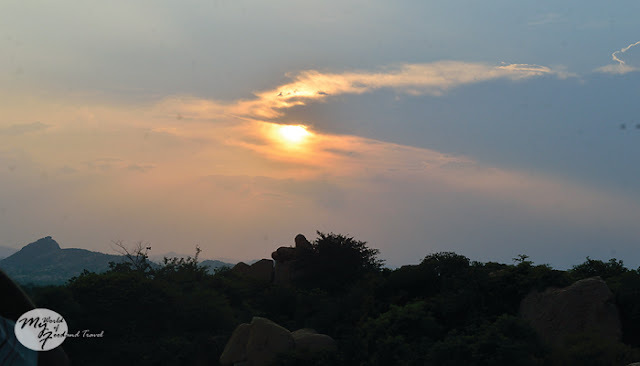 Update: Here's Part 2: Birding in Hampi! Great narration. 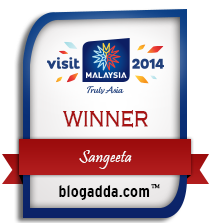 Certainly visit this place soon. I always thought of beautiful ruins, when I thought of Hampi. Thank you for taking me to the Daroji Bear Sanctuary. What magnificent sights of the bears and other animals. Definitely on my must visit list!